Custom Behavior definition (for XEO Model Events, Methods, Attribute Events and Attribute Logic (requirement, validation, etc...). To create Schedules and Threads that perform background operations on instances of XEO Models. Applications sharing the same J2EE server as the XEO application who want to access information in XEO Model instances. A XEO application is all about creating instances of XEO Models, setting values for their attributes, processing lists of XEO Model instances, handling events generated for those instances and executing methods. 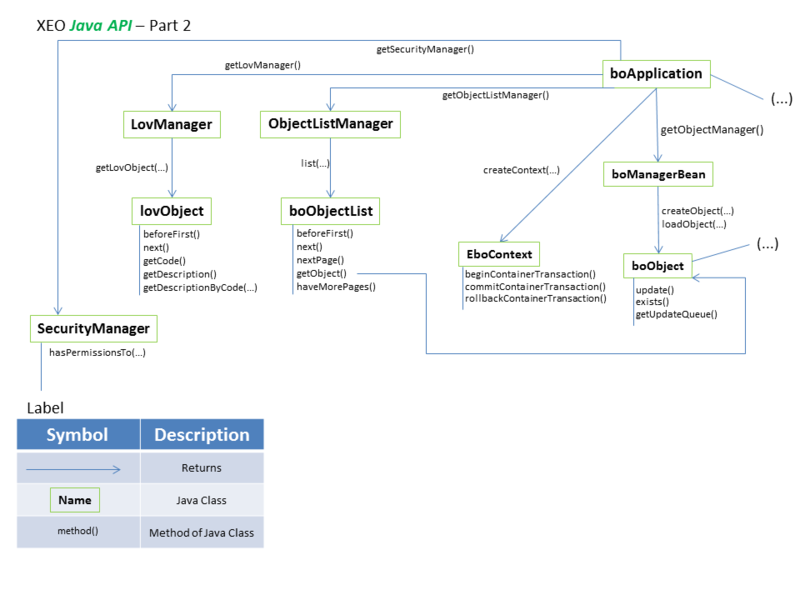 Recall from the Object Behavior chapter the basics for the Java API. A XEO application has an entry point which is an instance of the boApplication class. 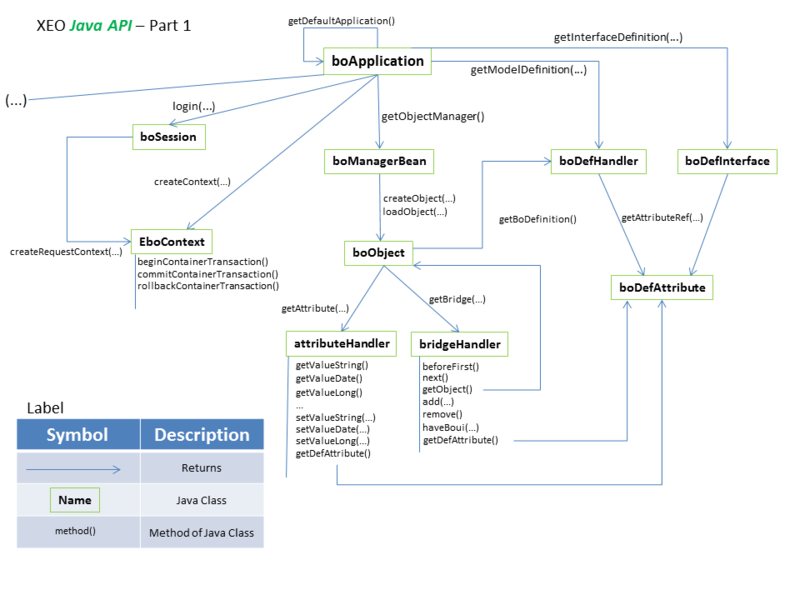 The boApplication instance provides access to most features of the XEO Java API. When implementing custom behavior for XEO Models, you (probably) won't need the boApplication instance as you'll have access to instances of XEO classes that'll allow you to implement your logic. When creating custom Java code to define behavior for a given XEO Mode, as seen in the Object Behavior chapter, most of the times you'll be given access to a boObject instance and/or an attributeHandler instance. The boObject represents an instance of a particular XEO Model and is the most important class in XEO's Java API as it allows access to an instance's attributes and its definition. To know more about the boObject class, read the boObject API page. The boManagerLocal interface represents the manager of boObject instances, which allows to create and load those instances, read more in the boManagerLocal API page. The ObjectListManager class allows to create instances of the boObjectList class which represents a lists of boObject (as the name implies). boObjectList instances are created by issuing BOQL queries against the datasource (typically a DBMS) and its results are paginated (default value: 50 results per page). boObjectList instances are much like (paged) iterators, to know more about the API check the ObjectListManager API page and the boObjectList API page. Interactions with XEO Model attributes can be done using the AttributeHandler (all but collection attributes) and BridgeHandler (collection attributes) classes. These classes allow to retrieve and set the value(s) of the attribute as well as reaching the attribute definition. Read more about AttributeHandler and BridgeHandler. The bodefHandler class is a programmatic way to have access to a XEO Model definition. Read more about boDefHandler. Beggining with version 3.2.014 XEO comes with the netgest.bo.system.XEO class which acts a central point of access to several APIs, c heck the documentation page. //Create a new instance object for Class "A"